Even though its first trailer wasn't released until Friday night, Marvel's Black Panther still managed to dominate social media last week! According to media-measurement firm comScore (via Variety) and its PreAct service, Black Panther generated 466,000 new conversations on social media last week. Of course, much of that is due to its trailer, which made its debut during Game 4 of the NBA Finals, as well as its first poster. That figure is even more impressive than it already is when you think about this: Marvel wasn't even planning to release the trailer last week. 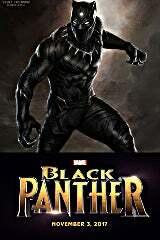 Reportedly, Marvel wanted to wait until this week to release it during Game 5 or maybe even Game 6, but when the Golden State Warriors won the first three games against the Cleveland Cavaliers, there was no guarantee that there would be a Game 5, so Marvel had to release the trailer on Friday to ensure tons of eyeballs would be on it. That meant, thankfully, that we didn't have to endure several teasers for the teaser trailer -- as is normally the case nowadays. As for the trailer itself, it received a jaw-dropping 89 million views in its first 24 hours. Comparing that to other films from Marvel Studios, Black Panther is third-best in that time-frame, putting it behind Thor: Ragnarok (136 million views) and Captain America: Civil War (94 million views). More importantly, Black Panther squeezed past the second teaser trailer for Star Wars: The Force Awakens, which had 88 million views back in April 2015. After being the king of social media buzz the previous week, generating 175,000 new conversations in the wake of new domestic and international trailers and posters, Spider-Man: Homecoming came in second-place last week. It generated around 88,000 new conversations as Marvel and Sony put out some new footage and there was some headlining grabbing "news" about Zendaya's character. Meanwhile, Cars 3 took third, generating 45,000 new conversations; Transformers: The Last Knight came in fourth with 21,000 new conversations; and Star Wars: The Last Jedi grabbed fifth-place, producing 13,000 new conversations. Either way, Walt Disney Studios has to be quite pleased today, as four of the five most-talked about films on social media belong to them. WOW!